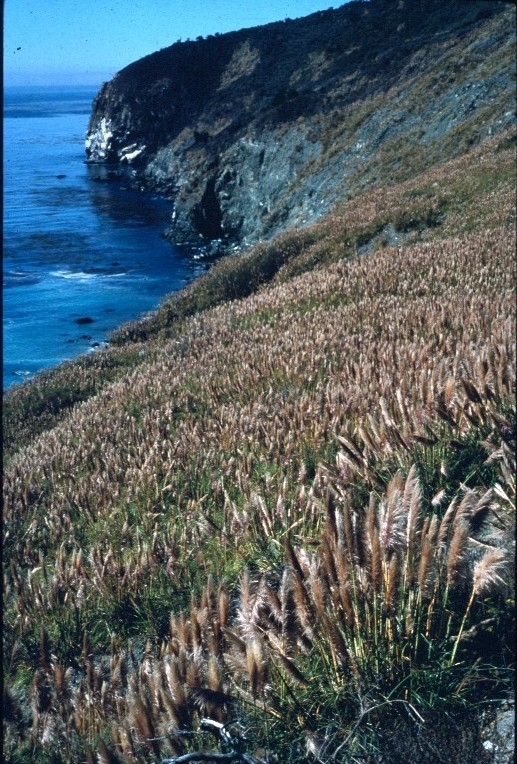 Through Sustainable Conservation and the California Horticultural Invasives Prevention (Cal-HIP) committee, the PlantRight campaign was founded in 2005. PlantRight has brought together leaders from the nursery industry, environmental groups, and academics. Its goal is to address the ongoing sale of invasive garden plants in California and to develop a strategy to remove these plants from retail sale, as well as to prevent new potentially invasive plants from being introduced. To accomplish this first objective, PlantRight teamed with the UC Master Gardener program in 2011 to survey over 225 retail nurseries throughout the state for 19 known invasive species originating from the industry. The survey has been conducted every year since, and is gearing up for the 2016 survey of 300 retail nurseries. The results of this collaborative effort have been beyond expectations. Of the 19 species initially surveyed by PlantRight, 15 have now been retired from the survey. These include many well know invasive plants, such as arundo, saltcedar, blue gum eucalyptus, Russian-olive, scarlet wisteria, capeweed, myoporum, Scotch, French, Spanish, bridal veil and Portuguese brooms, jubatagrass, crystalline iceplant, and Chinese tallowtree. The survey showed that these species are either no longer sold or are sold in less than 1% of the nurseries surveyed. In part, these plants may no longer be popular among gardeners or landscapers, but their removal from the retail market can also be attributed to the attention they receive as invasive species and to the invasive plant education program directed at the industry and homeowners. 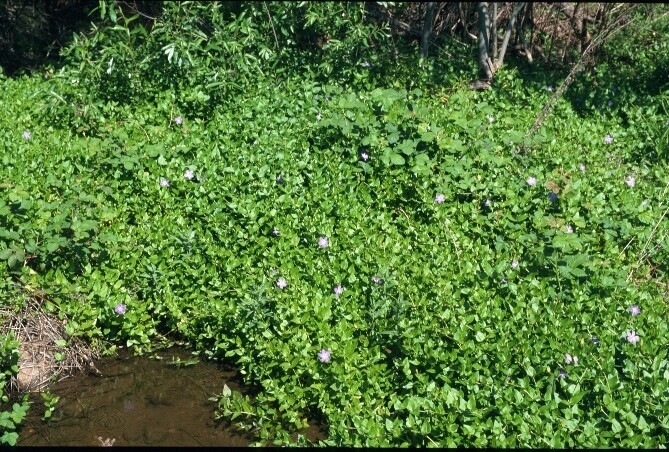 Included among those invasives still for sale and continuing to be surveyed are pampasgrass, green fountaingrass, periwinkle, and highway iceplant. In addition, PlantRight has added three new plants to the survey list, including Mexican feathergrass, water hyacinth, and yellow water iris. It is clear that the impact of PlantRight and the UC Master Gardener Program on removing invasive ornamentals from nursery sale has been substantial and continues to make progress. As a second part of the PlantRight campaign, they worked with UC Davis researchers to develop a model to predict the potential for newly introduced ornamental species to escape cultivation. This model, called PRE (Plant Risk Evaluation), was published last year in PLoS ONE and demonstrated close to 100% accuracy when used to validate known invasive and non-invasive ornamental species. The model is now being used to evaluate a number of other ornamental species, including newly introduced plants and plants demonstrating some level of escape elsewhere in California or the world. 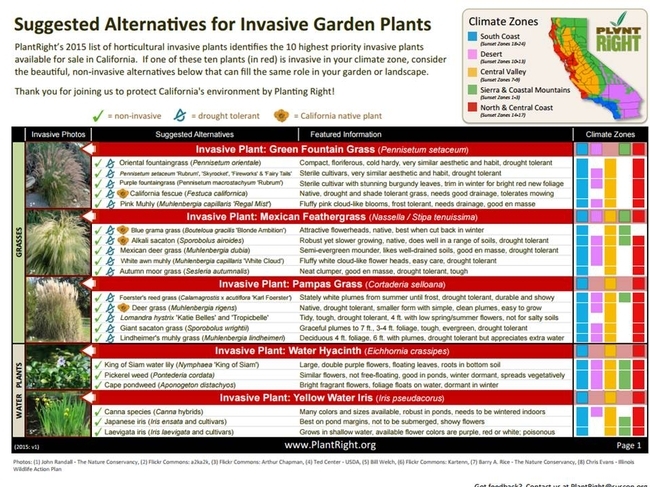 For more information on the PlantRight campaign and lists of alternatives to known invasive plants see their website at http://www.plantright.org/.